I recently had a Peppermint Mocha from the coffee shop by work, Dunn Bros. It was SO amazingly good. I knew I wanted to try and capture the essence of that drink into a yummy little cupcake. I think I got pretty close. The mocha flavor isn’t too overpowering and the peppermint is really refreshing. Perfect treats for my potluck at work! 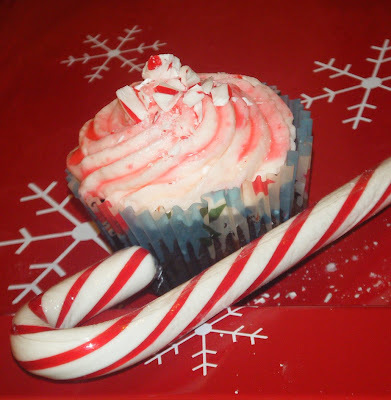 My friends & coworkers LOVED the peppermint frosting. It would be really fun to add to lots of different cupcake treats! My only advice is, if you plan on topping the buttercream frosting with more crushed candy, do it RIGHT BEFORE SERVING! I topped mine the night before, and come morning, the candy had completely dissolved into little pink puddles! Fill paper-lined muffin cups three-fourths full. Bake at 350° for 15-20 minutes or until a toothpick comes out clean. Cool for 10 minutes before removing from pan to a wire rack to cool. Beat butter in large bowl with electric mixer on medium speed until light and fluffy. Add Peppermint Extract; mix well. Gradually beat in confectioners’ sugar, beating until well blended after each addition, frequently scraping sides and bottom of bowl. Add milk; beat until light and fluffy. If frosting is too thick to spread, gradually beat in additional milk. Last, add in crushed peppermint bits. Store in refrigerator up to 2 weeks. Rewhip before using. I made peppermint chocolate cookies this week–it’s totally that time of year! The cupcakes look delicious! Yum! I love peppermint mochas, so I am definitely going to give this a try! Oh my goodness, those look insanely good! I made these this past weekend ~ absolutely loved the icing. These cupcakes are adorable! Great job.